The Government of Sierra Leone in collaboration with World Health Organization has kicked start the celebration of the United Nations (UN) 4th Global Road Safety Week with the theme ‘Speed Management’ at the Miatta Conference Centre in Freetown. The event started on the 8th and is expected to end on the 14th May 2017. In his keynote address, the Honourable Minister of Transport and Aviation, Leonard Balogun Koroma said, deaths are a tragedy for all affected while injuries can cause suffering, economic loss and life changing misfortunes in our society. He added that finance losses to individuals and families, as in many cases, not mitigated by adequate insurance coverage or safety nets, therefore may lose their only breadwinner or left with very high health care bills. Hon. Leonard Koroma disclosed to his audience that the most often road traffic crashes and fatalities are as a result of; the Attitude of Drivers and Motorists, Over Speeding, Fatigue on drivers, especially trucks or lorry drivers, Poor road conditions, poorly maintenance vehicles to name but few. He continued that most of the harm and cost is avoidable and it’s not an inevitable consequence of road transportation. Hon. Koroma added that as a government, they believe further policies are required to strengthen the existing policies even though their agencies have tried their level best in its implementation. 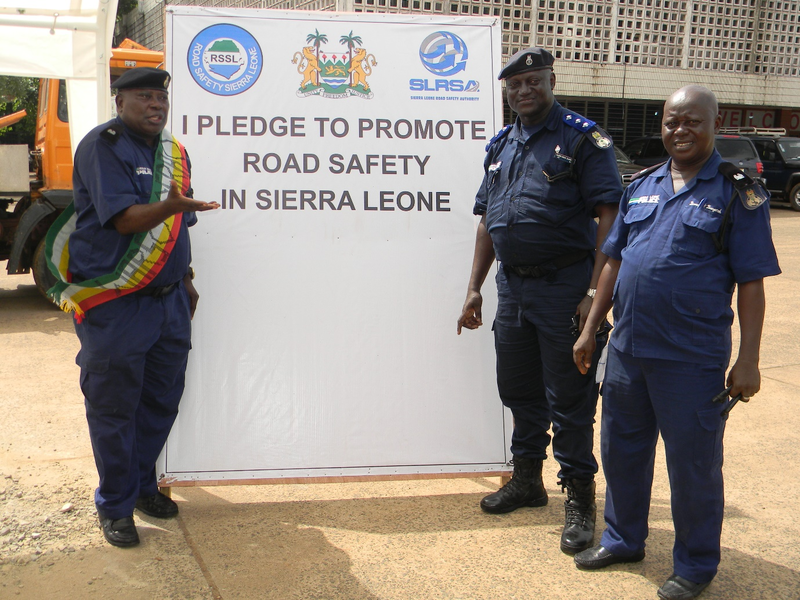 They Executive Director of the Sierra Leone Road Safety Authority, Dr. Sarah Bendu said the week is focused on speed and what can be done to address this key risk factor for road traffic deaths and injuries. She added that it also seeks to increase understanding of the dangers of speed and generate actions or measures to address speed, thereby saving lives and the roads. Dr. Bendu called on all stakeholders, both national and local governments, international agencies, civil society organizations, private companies, and the public in every member country to plan and host events marking the week. The SLRSA boss explained why speed management was chosen for this year’s celebration and it effect if not control to the human resources of any country. She went on that speed can be managed by building or modifying roads to include features that calm traffic, establishing speed limits appropriate to the function of each road, reinforcing speed limits and raising awareness about the dangers of speeding. A Power point presentation was made by the Director General of Sierra Leone Roads Authority, Engineer Mrs. Memunatu Kumba Jalloh on the roles and responsibilities of SLRA, Presentation from Total Company representative, World Bank Representative, the Sierra Leone Police, Road Maintenance Fund Management, and the Director of the SLRSA Board. The delegates amounting to about 200 were divided into 5 groups focusing on the five pillars for the Decade of Action for Road Safety. Each group was led by a Team Leader to discuss key issues and develop a five- year action plan during the plenary session. The group then selected a Rapporteur who later presented the key issues with agreed action points to all the delegates. As part of the Commemoration of the UN Global Road Safety Week (8 - 14 May 2017) Road Safe Salone (RSSL) a community interest group in collaboration with the Sierra Leone Police and the Sierra Leone Road Safety Authority organized a Roadshow at Lumley Police Station and the Taxi Park at Congo Cross Roundabout in Freetown to sensitize the public including school children about road safety. The Roadshow consisted of skits and dramatization of road accidents to highlight the dangers of speeding, drink driving, obstruction caused by street traders and the efficient use of Zebra crossings. This was followed by an open quiz for the audience to answer questions on some of the key messages presented by the dramatists and the winners received prizes donated by various corporate organizations in Freetown.